Did you know that there’s a special chicken you eat when you get engaged.? A chicken so treasured, so perfectly roasted, so exclusive, so only for people with fresh diamonds on their fingers that it’s actually called Engagement Roast Chicken. Yea… it’s for people who have decided that they want to spend the rest of their lives with other people. Boy oh boy… engaged people have it GOOD! I mean… we could go on forever and ever. Infinity Roast Chickens. This recipe is easy, delicious, and all the way Ina Garten’s. She knows her way about a chicken. Let’s not mess with a good thing… let’s just make it less marriage-bound for sanity’s sake. We’re working with lemon, garlic and onions. Keeping it simple and supreme. The inside of the chicken is seasoned with salt and pepper and stuffed with lemon wedges and a whole head of garlic, halved but raw. Flavor inside the bird will roast up and out. The bird is brushed liberally with olive oil and seasoned liberally with coarse sea salt and fresh cracked black pepper. Into a roasting pan, or whatever sort of roasting-ish pan you might have on hand. Onions are sliced thick and tossed in olive oil, salt, and pepper along with the remaining lemon wedges. Essentially we want everything to taste exactly as it does, just highlighted with salt, pepper, and citrus. Wedged and nestled and ready to roast! While the chicken roasts, why not revisit old episodes of The Real World, Seattle… that’s what I would do / did. One hour and fifteen minutes to adult-living victory. The chicken rests while we make a gravy… because we’re grown and we make gravy dangit. We make gravy! Any and every occasion roasted chicken. Tender ad juicy. Lemon scented with gravy. Almost sweet onions served with farro and peas. It’s dinner, we’re worth the time and energy. Place a rack in the center of the oven and preheat the oven to 425 degrees F.
Remove and discard the chicken giblets if you find them inside your chicken. Pat the outside of the chicken dry with a paper towel. Liberally salt and pepper the inside of the chicken. Cut the lemons in quarters, place 2 quarters in the chicken along with the garlic and reserve the rest of the lemons wedges for the roasting pan. Brush the outside of the chicken with olive oil and sprinkle the chicken liberally with salt and pepper. Tie the legs together with kitchen string and tuck the wing tips under the body of the chicken. I didn’t tie my chicken legs but you should have. Place the chicken in a small (11 by 14-inch) roasting pan. (If the pan is too large, the onions will burn. You want to have everything close together. Toss the reserved lemons and onions in 2 tablespoons olive oil, a bit of salt and pepper. Squeeze the reserved lemons over and around the chicken and place everything in the roasting pan around the chicken. Roast the chicken for about 1 hour and 15 minutes, until the juices run clear when you cut between a leg and a thigh. Remove the chicken to a platter and place onions and lemon on the platter with the chicken. Cover with aluminum foil, and allow to rest for 10 minutes while you prepare the sauce. Place the roasting juices in a small saucepan, add chicken stock, and bring to a boil over medium heat. Place flour in a small bowl and whisk in 3 tablespoons of the hot roasting juice and broth. Stir until no lumps remain and return the mixture to the saucepan. Add the white wine and stir, boiling gently, until thickened, about 5 minutes. Carve the chicken onto a platter and serve with the lemons, onions, and warm sauce. Haha great post! Love your writing. This chicken turned out so beautifully, too! I can’t wait to give this recipe a try. I love love love that you associate making gravy with being “grown”… I don’t know what it is about gravy, but the first time I looked at all the liquid in a post-meat-cooking pan and thought “What would grandma do? Grandma would not waste that goodness. Grandma would stir some flour in there and make delicious gravy” – I felt like I had truly arrived at a special place. The kind of place where I could buy a house, and raise a child, and get a steady job, and do my taxes EARLY and make my bed every morning and sweep once in a while and make responsible choices. And it was awesome. Still working on most of those things. But I’ve got gravy down. The one and only time I tried to roast chicken was in our small apartment, with zero ventilation and an electric oven. I got really distracted by the new, not so great Robocop and suddenly the house filled with smoke and I really…can’t possibly…fathom what went wrong…not. Needless to say, the cat had to go in the bedroom and the door and windows were open for quite a while. My husband has since banned me from roasting chicken (why not just buy one at Rouses, he says) in the house so maybe I’ll try this and call mine “Please Don’t Burn my New Apartment Down or Smoke Us Out of the Apt Roast Chicken?” Bit lengthy, but accurate. Just wanted you to know, I love your blog. I’ll have to teach this recipe to my two teenage sons – the guys should definitely be wooing the women in the kitchen as well! Another great chicken recipe is the Zuni Cafe (SF) roast chicken. I just thought I would let you know that Engagement Chicken is not, in fact, a celebratory meal for the newly engaged. Engagement chicken is what you cook for your boyfriend when you want him to pop the question. This chicken is so good that serving it to him will immediately make him think of you as wife material, and diamond rings will ensue. I just think that’s so outrageous that you needed to know. Long live Slight Fear of Commitment Roast Chicken, I say! Lol, that’s what I always thought it meant, too. Rather an old fashioned concept, right? Oh, Ina is such a nutbar, I mean great food (! ), but really… engagement roast chicken? Your version looks delicious and with the name change I feel much more included. I call this ” I kicked his lying cheating self to the curb and now he will NEVER enjoy his favorite roast chicken ever again” Ha! I love making this for myself- lots of leftovers for me. I married nearly 29 years and I did roast chickens when we were dating-never knew that sealed the deal! What would Ina think? It’s truly difficult to choose a title for this chicken as I love all your titles! On a technical note, an because I over analyze, do you mean ‘cut a whole head of garlic in have but keep the skins on’ or ‘cut each clove from the head in half once the skins are removed’? 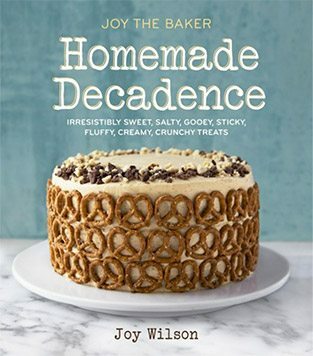 Thank you for your ever-enlightening recipes, Joy. I hope Tron got a scrap of that delicious chicken! good note! i’ll amend the recipe. Reading this in a lecture hall with 100 people around is a bad idea! I was trying so hard not to laugh, so hard that tears were coming out of my eyes! I looked like a crazy lady! I’m going to need to make an “I Just Made a Public Fool of Myself Roast Chicken” for dinner tonight! Joy, I love you. That is all. Hahha! You had me giggling all the way through this and that’s some feat when we’re talking about a humble roast chicken! :D! I actually make almost this exact recipe a lot at home. I work from home and love how easy it is to just chuck in the oven as the day is wrapping up….everyone comes home and the first thing they say is “….wow it smells good in here! !”.